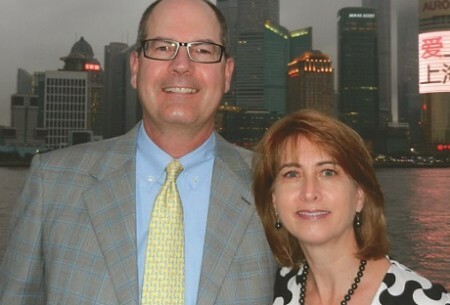 GAINESVILLE, Fla. — Paul and Heidi Brown, both University of Florida graduates, have given $1.5 million to establish a faculty position in industrial and systems engineering, one of the nation’s top-ranked programs. The new position will further strengthen the department, currently ranked within the top 10 public industrial engineering programs in the nation, according to U.S. News & World Report. The couple met in the ISE department more than 30 years ago as classmates in Weil Hall, sitting nearer and nearer to each other throughout two semesters of operations research. Eventually, the two “military brats” fell in love, and UF became the home base that neither of them had experienced as children. It would remain that way as their careers took them all over the world. During a recent lecture at the College of Engineering, Paul joked that he is “a bit of a dinosaur,” for having worked for just one employer throughout his career; but that dinosaur worked his way up the ladder to become a corporate officer and vice president of the largest paper and packaging company in the world. International Paper is a leading Fortune 500 company and Paul has led operations in China, India, Europe, Africa and the U. S.
Part of Paul’s dedication to supporting engineering education in the United States comes from his perspective of having seen engineers working overseas. ISE has earned its reputation as a top 10 engineering program by pioneering research and practical solutions to the biggest issues facing our world, including health care, energy systems, big data and security. An endowed chair will expand the academic freedom and research footprint of a distinguished faculty member, enabling the department to explore more transformative approaches to existing and emerging challenges. The Browns are enthusiastic to see their gift make a difference in their lifetime, and say they hope to see it bear fruit. “We have two kids, ages 17 and 20,” said Heidi, who worked for General Electric and Chrysler before the logistics of raising a constantly moving family became a full-time job.